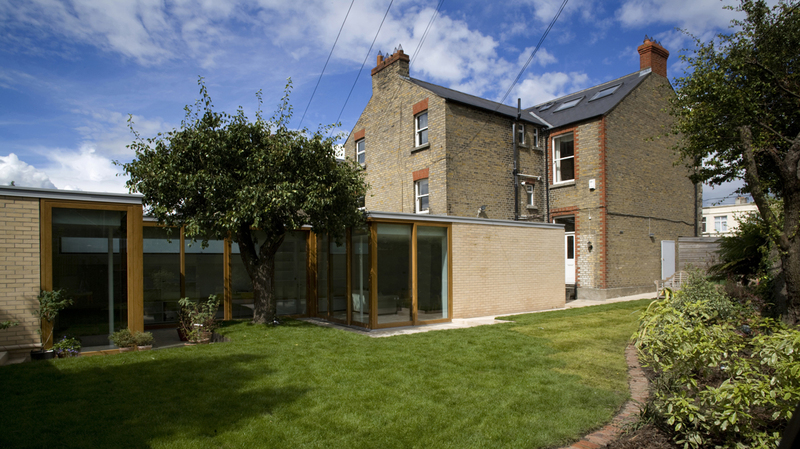 The existing return of a large Victorian house is extended to the rear boundary wall. This new form is then cut in two places; firstly, to make a south facing courtyard that encloses an existing pear tree; and secondly, to make a high level window in the north boundary wall that introduces evening light in the summer time. 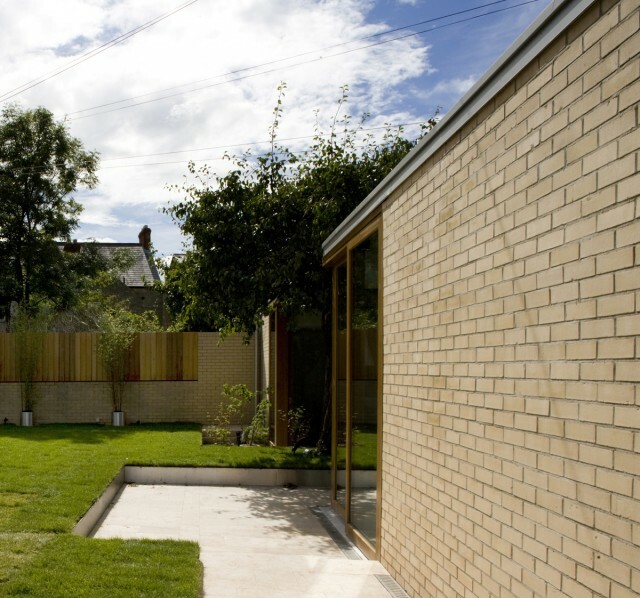 A contemporary brick screen is made to the garden complimenting the brick of the existing house. 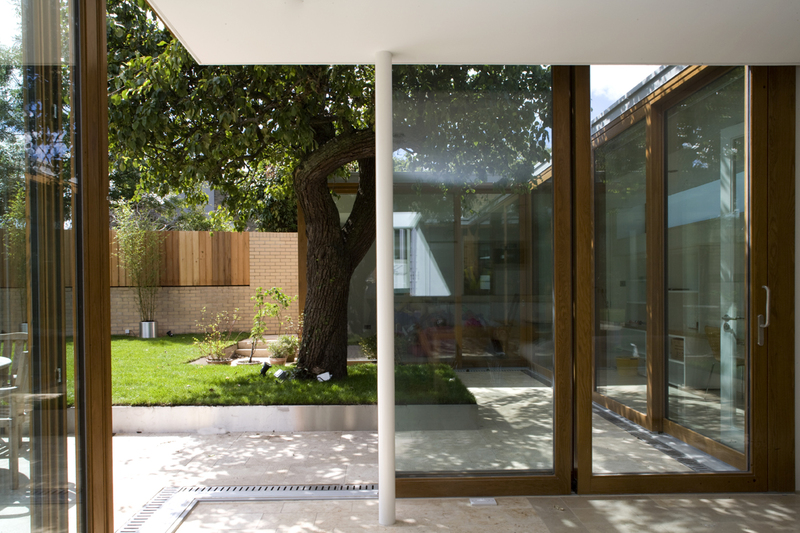 Tall sliding oak screens open up all of the spaces to the garden and the continuous stone floor blurs the transition from inside to out. The original house is a Victorian semi-detached house located onKenilworthParkin Harold’s Cross. 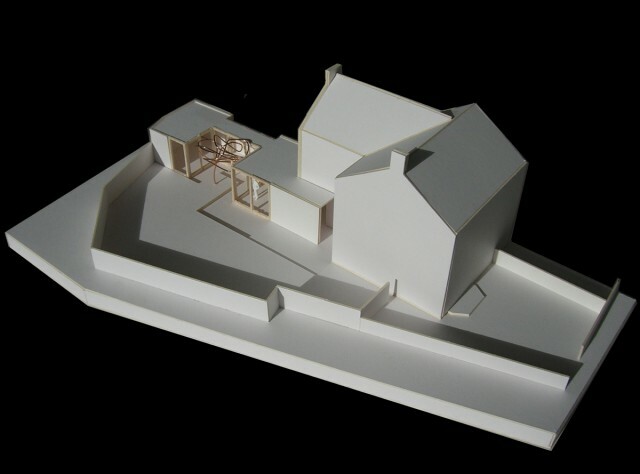 Due to a bend in the street the house has a large splayed garden with a south-west orientation. The house and adjoining houses are of a mixture of buff coloured brick and red brick with granite plinths and cills and slate roofs. The house had an existing single-storey extension attached to the end of the original return as well a separate utility room in the corner of the garden. The existing extension and utility room are demolished and are replaced with a new single-storey form that extends the footprint of the original return out to meet the rear boundary wall. 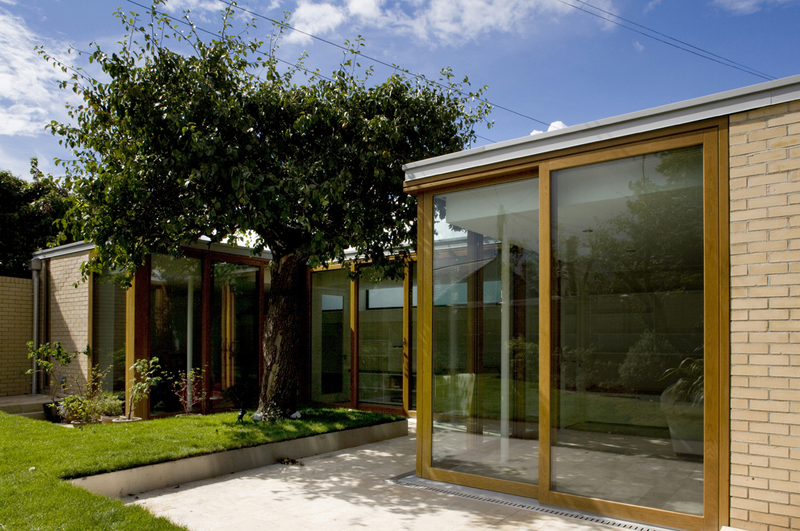 This new structure contains a family room, play room and study arranged around a south facing courtyard that encloses an existing pear tree. 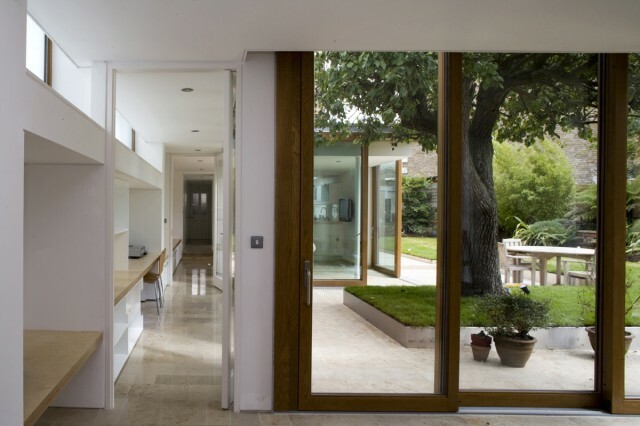 A new kitchen is made in the undercroft of the existing house, projecting slightly into the garden in order to make a doorway to a small utility court and to draw light in from a frameless skylight. A continuous line of storage units is arranged along the north boundary wall. A high level window above the desk in the study introduces evening light in the summer time and also serves to minimise the impact of the structure on the neighbouring garden. The new elevations are made as simply as possible, using materials that are sympathetic to the original house in a contemporary way. Solid brick walls and full-height openings articulate the new construction as a series of screens standing within the continuous space of the garden. The internal floor and external terraces are made from the same stone, reinforcing this sense of continuity. The structure is a combination of perimeter bearing walls and a steel frame forming the full-height openings and supporting the existing return. The circular steel columns are kept away from the corners to allow the internal spaces to open up completely to the garden. A contemporary brick screen is made to the garden complimenting the brick of the existing house. The sliding doors are made from European White Oak and are brought right up to the underside of the metal coping, articulating the elevations as a series of screens. Particular attention was given to the design and fabrication of the frameless sliding corner in the family room. 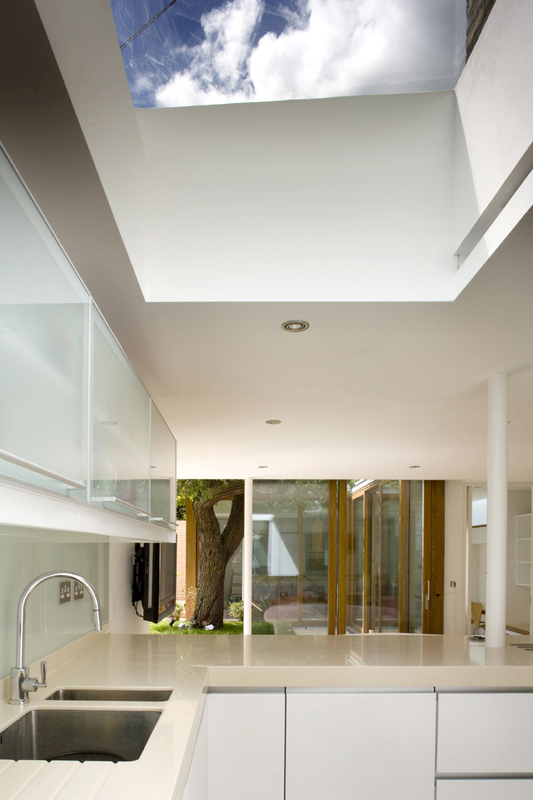 The stone floor is ofBremenlimestone, polished internally and sand-blasted externally. A continuous drainage channel with a perforated stainless steel cover allows for the same level to be maintained both inside and outside, increasing the sense of a continuous space. 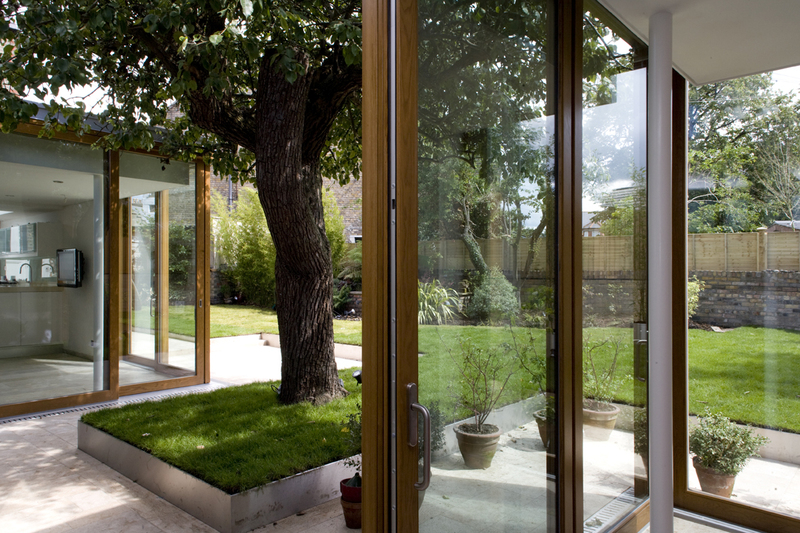 We create delightful gardens,made from environmentally,friendly materials,all this to protect the mather nature.